Hope you are having a wonderful summer. 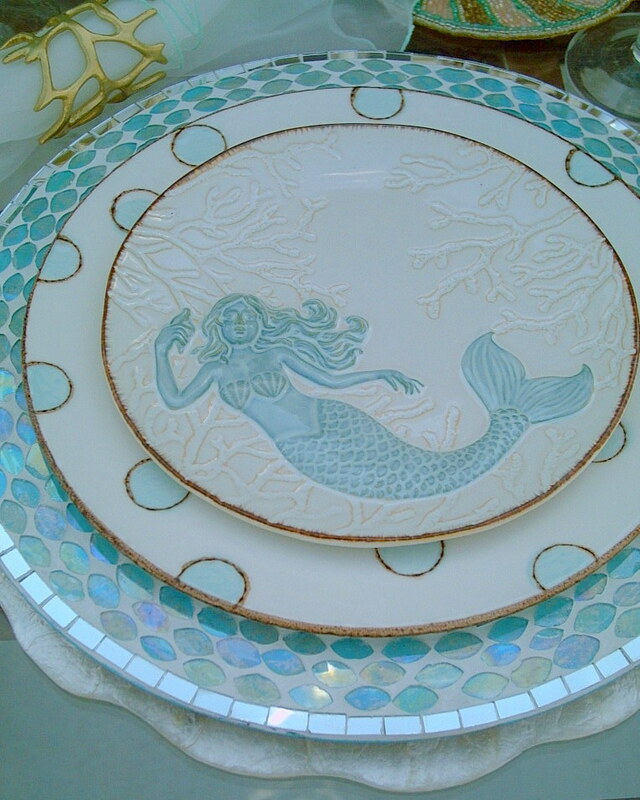 My tablescape was inspired by the enchanting Mermaids found on these adorable plates from Cracker Barrel. Soft aqua's and gold. I love this color combination. Whimsical and fun. 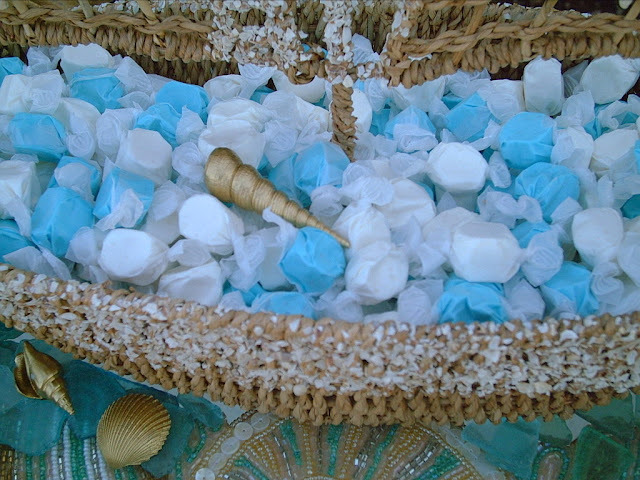 The sailing ship holds some aqua blue and white Salt Water Taffy. I am using two goblets today. 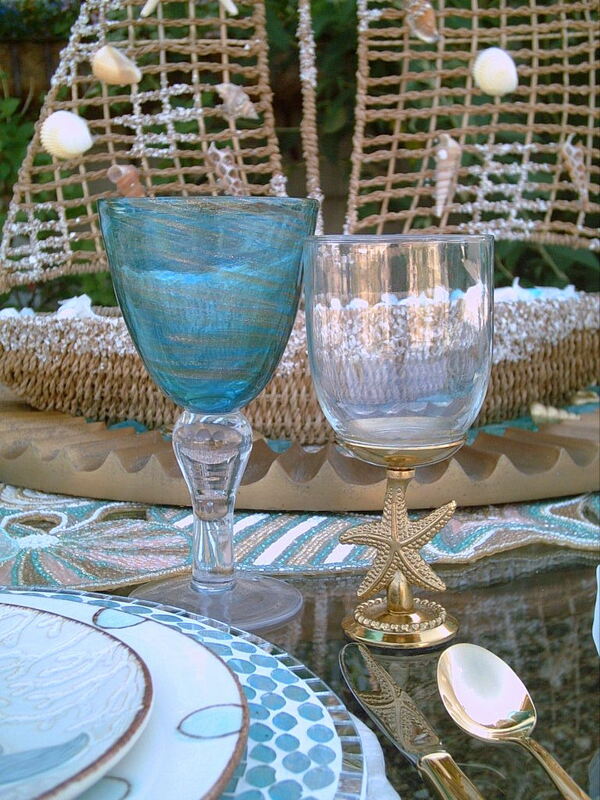 The blue with swirls of gold and the ocean creature golden goblets in two different versions. One has a golden Sea Horse, the other a golden Star Fish. 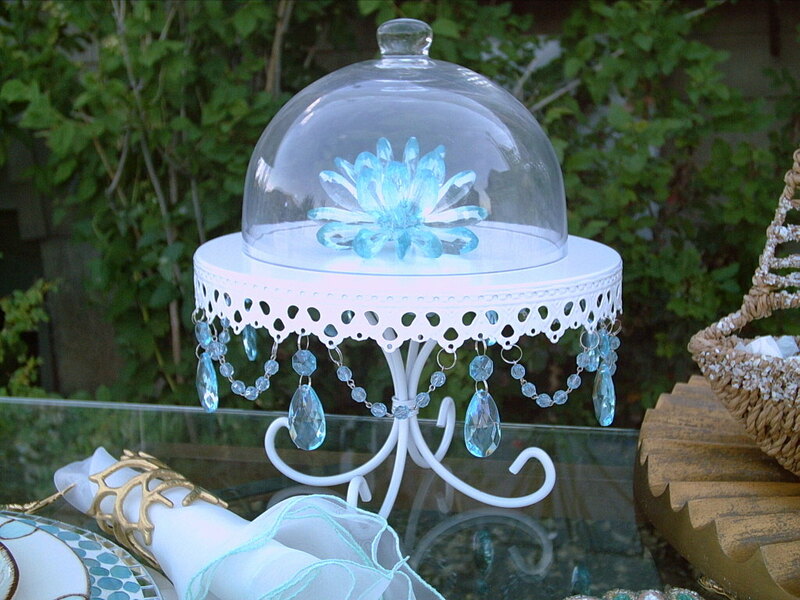 White cake pedestal dripping with aqua colored jewels. Closeup of the napkin and napkin ring. The napkins were purchased some time ago but are still available from The Square Nest. Sheer white organza with an aqua embroidered edge. 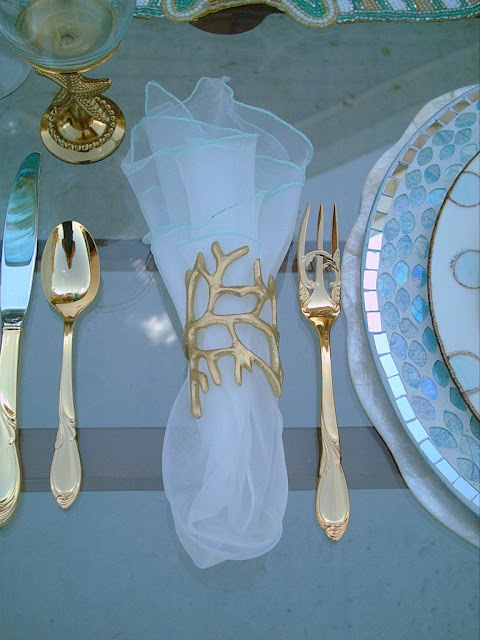 The coral napkin rings are from Pier 1. Originally silver, I sprayed them with a gold leaf paint. 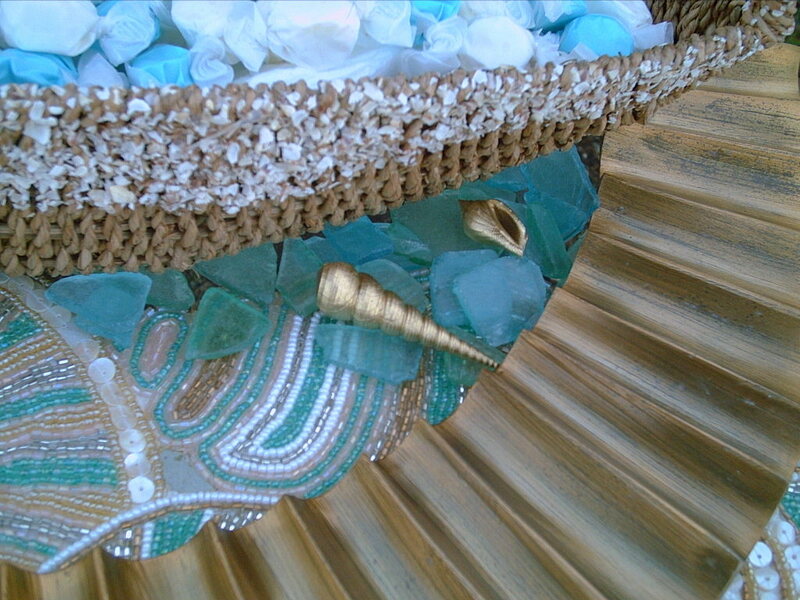 Aqua, blues, and green Sea Glass, with some golden shells. All surrounded with a golden frame, that looks like rippling water. Flatware in the golden version of "Cache" by Yamazaki. 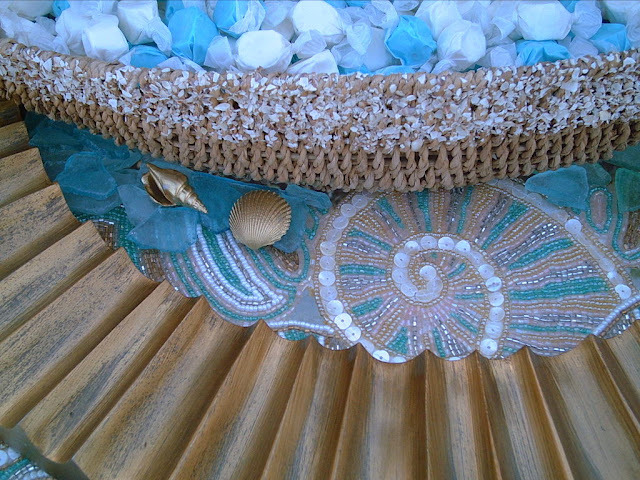 Runner is beaded with jeweled shells. From Pier 1. I love the dinner plate from Home Goods with the floating bubbles. I got them on sale for two dollars each! A candle to light the way. Please feel free to leave a comment below. I love reading your comments. 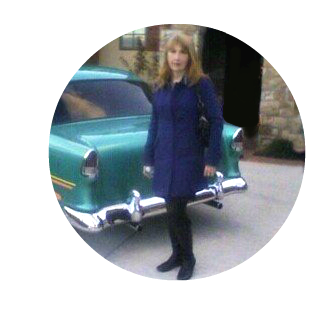 I will be sharing this with Celebrate Your Story. 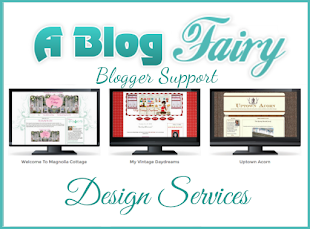 http://www.lifeandlinda.com/2016/07/dishing-it-digging-it-link-party-103.htmlSharing with Dishing It & Digging It. Oh goodness Valerie, you know I love this table! 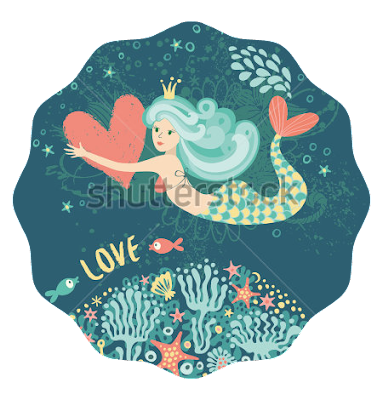 I love anything in aqua and add mermaids and seashells and I'm in heaven! I wanted to buy that beaded runner for Pier 1, it's so pretty, and those mermaid plates paired with dots and gorgeous charger plates make me swoon! so smart to use salt water taffy!! 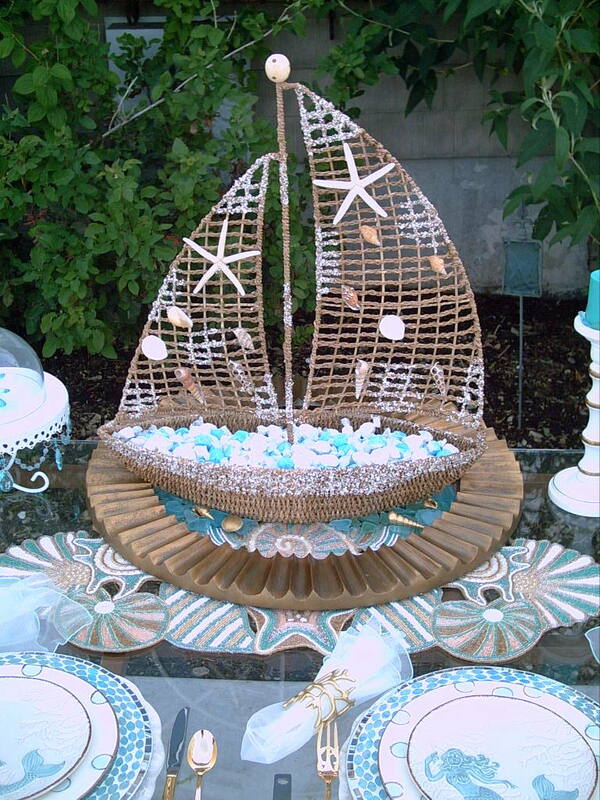 and the sailboat, how cute it that!! It's all too fabulous! Oh my goodness sake, this is absolutely gorgeous! Love the soft colors and so many awesome details. The runner is so pretty. Love the plates...in fact, I love everything. I hope you share this at our link party this Sunday. Be sure to add my link, so when they pick features, you can be in the running. You've outdone yourself with this one everything is exquisite! Every piece and detail is gorgeous and you worked this theme like no other. Thank you so much for sharing this with us at Celebrate Your Story! 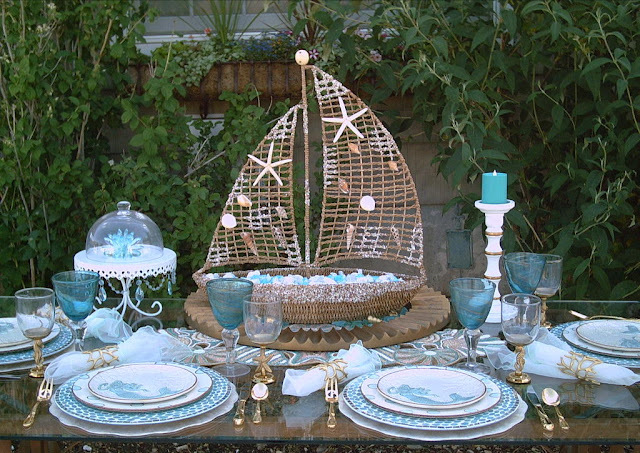 I love your beautiful and whimsical tablescape. It is gorgeous. I love all the little details. 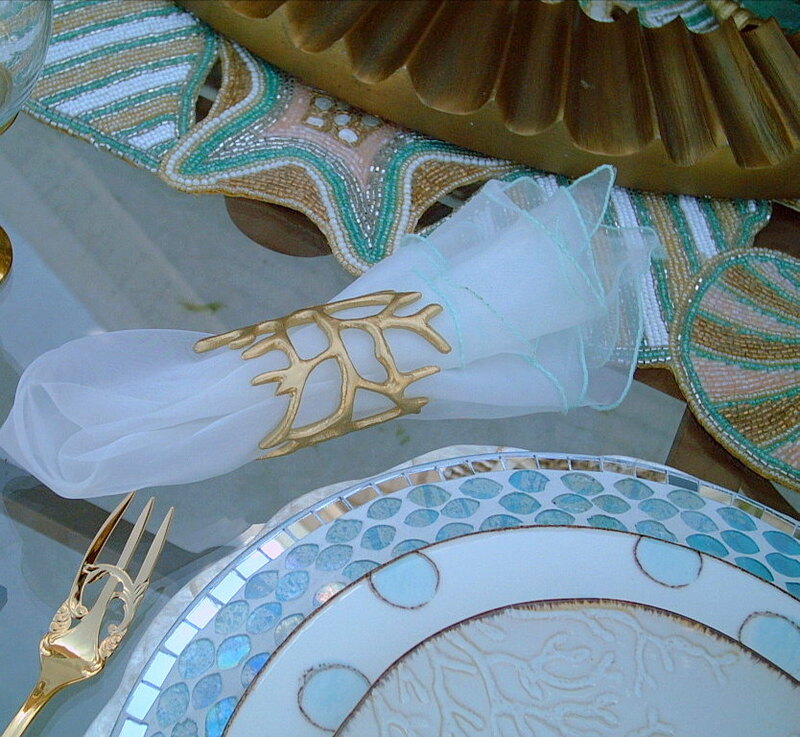 I also love those napkin rings. This is absolutely gorgeous! 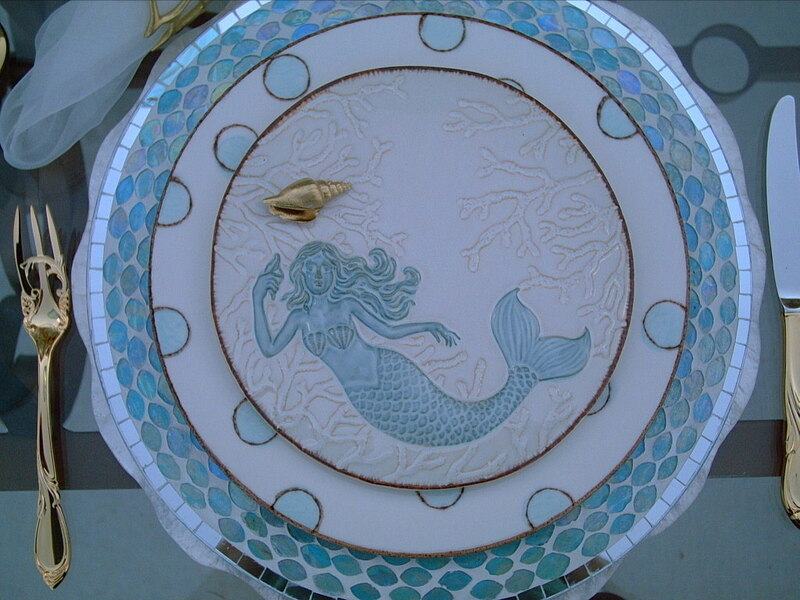 Who doesn't love dining among mermaids? 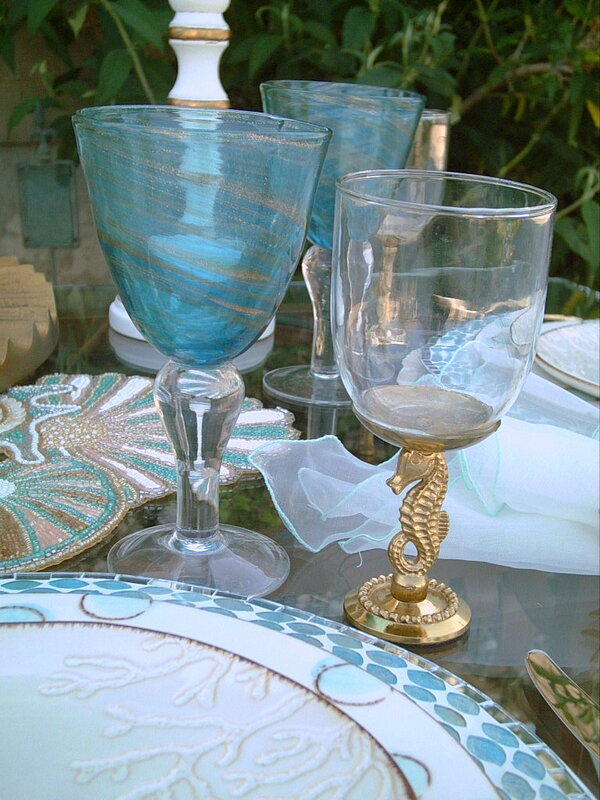 Your tablescape is truly the perfect summer escape right inside your own home! Thank you so much for sharing this week with us at Dishing It & Digging It! Oh, what a beautiful table. I'm loving the aqua and gold together! Saw that you were featured at Dishing It & Digging It and had to stop by...so glad I did! What a fantastic tablescape! Everything from the colours you chose to the beautiful dishware, flatware and stemware looks so pretty. Great ideas as well with the taffy in the boat and the rippled frame acting as water. Going back to pin! 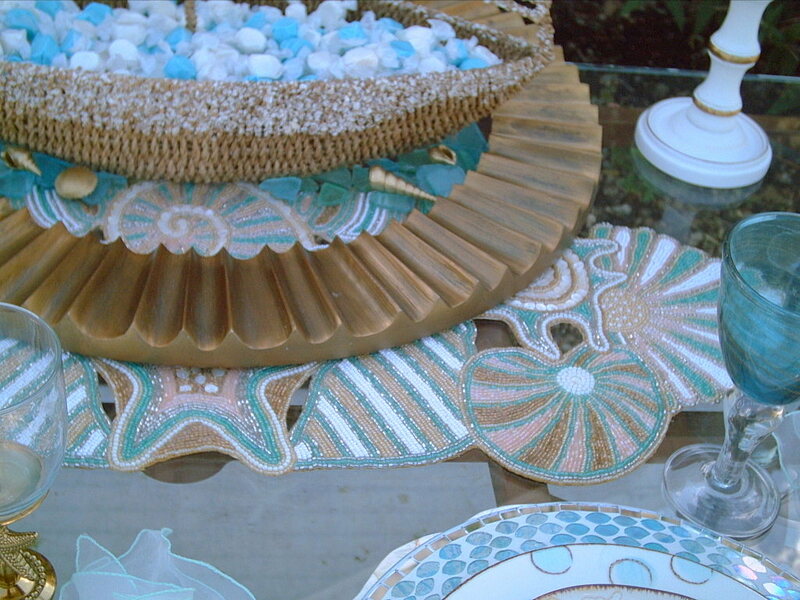 Your tables always make me swoon! What a fabulous table. I wanted to do a mermaid table for the grands! They all have mermaid tails I made and these would be so fun! Every little detail is wonderful too! I can't believe you got the bubble plates on sale! Too gorgeous! Even the forks look like King Triton's trident with a swirl of seaweed! Bravo!! I am so in love with your wonderful Mermaid plates and your drop dead gorgeous tablescape. Summer "By The Sea" tables are my favorites, and yours meets all of my expectations. 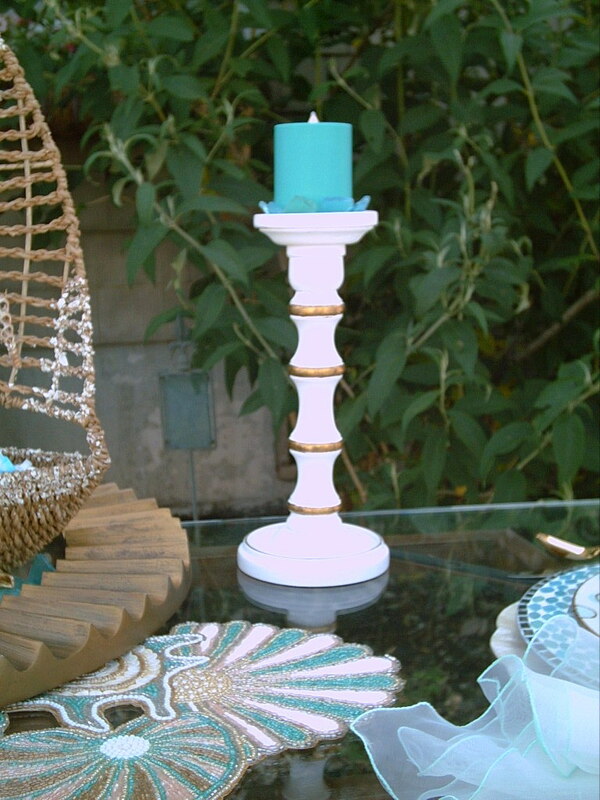 I feel so inspired right now that I am almost thinking of doing a summer table myself. Almost.... All of the boxes with my china and glassware are in storage as well as all of my seasonal decor. I can not wait to get on with my life when this house is finally sold. This is just beautiful! I love it! It all goes together so well. Every detail is perfect. 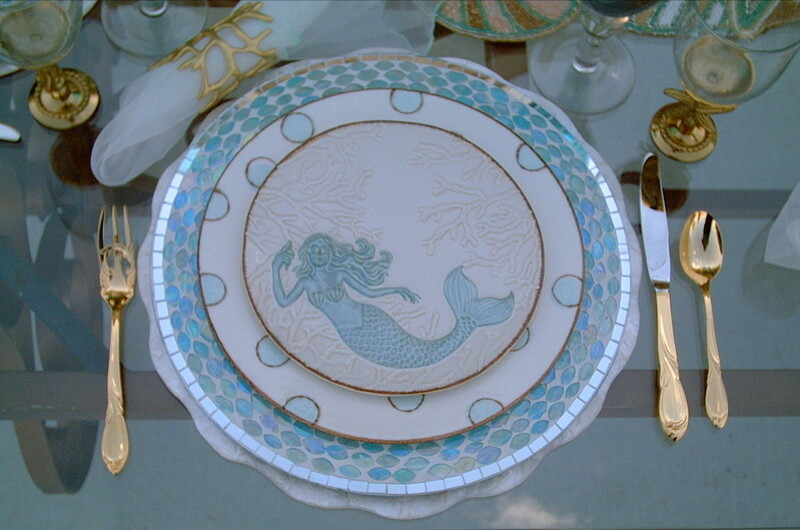 I have been thinking of a beach theme tablescape, but had not considered mermaids. Just my colors too. Thanks for the inspiration!